My research is aimed at finding the cause and a cure for Parkinson's disease. Parkinson's disease (PD) is defined by a characteristic set of locomotor symptoms (rest tremor, rigidity, bradykinesia and postural instability) that are believed to be caused by the selective loss of dopaminergic (DA) neurons in substantia nigra. The persistent difficulties in using animals to model this human disease suggest that human nigral dopaminergic neurons have certain vulnerabilities that are unique to our species. One of our unique features is the large size of the human brain (1350 grams on average) relative to the body. A single nigral dopaminergic neuron in a rat brain (2 grams) has a massive axon arbor with a total length of 45 centimeters. Assuming that all mammalian species share a similar brain wiring plan, we can estimate (using the cube root of brain weight) that a single human nigral dopaminergic neuron may have an axon with gigantic arborization that totals 4.6 meters. Another unique feature of our species is our strictly bipedal movement, which is affected by Parkinson's disease, in contrast to the quadrupedal movement of almost all other mammalian species. The much more unstable bipedal movement may require more dopamine, which supports the neural computation necessary for movement. The landmark discovery of human induced pluripotent stem cells (iPSC) made it possible to generate patient-specific human midbrain dopaminergic neurons to study Parkinson's disease. A key problem for dopaminergic neurons is the duality of dopamine as a signal required for neural computation and a toxin as its oxidation produces free radicals. Our study using iPSC-derived midbrain dopaminergic neurons from PD patients with parkin mutations and normal subjects shows that parkin sustains this necessary duality by maintaining the precision of the signal while suppressing the toxicity. 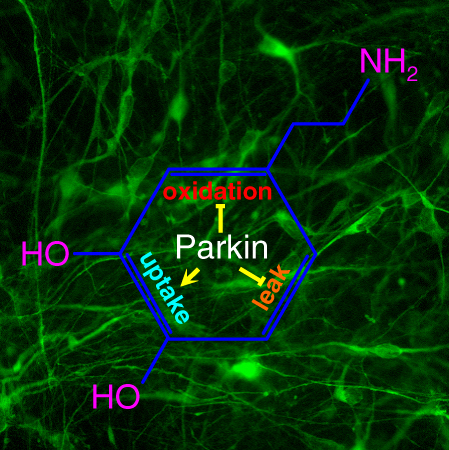 Mutations of parkin cause increased spontaneous release of dopamine and reduced dopamine uptake, thereby disrupting the precision of dopaminergic transmission. On the other hand, transcription of monoamine oxidase is greatly increased when parkin is mutated. This markedly increases dopamine oxidation and oxidative stress. These phenomena have not been seen in parkin knockout mice, suggesting the usefulness of parkin-deficient iPSC-derived midbrain DA neurons as a cellular model for Parkinson's disease. Currently, we are using iPS cells and induced DA neurons to expand our studies on parkin to idiopathic Parkinson's disease. We are also utilizing the molecular targets identified in our studies to find small-molecule compounds that can mimic the beneficial functions of parkin. The availability of human midbrain DA neurons should significantly speed up the discovery of a cure for Parkinson's disease. (27) H Li, H Jiang, B Zhang, J Feng (2018). Modeling Parkinson's Disease Using Patient-specific Induced Pluripotent Stem Cells. (26) P Zhong, Z Hu, H Jiang, Z Yan, J Feng (2017). Dopamine Induces Oscillatory Activities in Human Midbrain Neurons with Parkin Mutations. (25) Z Xu, X Chu, H Jiang, H Schilling, S Chen, J Feng (2017). (21) Z Hu, J Pu, H Jiang, P Zhong, J Qiu, F Li, X Wang, B Zhang, Z Yan, J Feng (2015). Generation of Naivetropic Induced Pluripotent Stem Cells from Parkinson's Disease Patients for High Efficiency Genetic Manipulation and Disease Modeling. (20) J Pu, D Frescas, B Zhang, J Feng (2015). (18) H Jiang, Y Ren, EY Yuen, P Zhong, M Ghaedi, Z Hu, G Azabdaftari, K Nakaso, Z Yan, J Feng (2012). Parkin Controls Dopamine Utilization in Human Midbrain Dopaminergic Neurons Derived from Induced Pluripotent Stem Cells. (17) Y. Ren, X. Liu, S. Lesage, M. Cai, J. Pu, B. Zhang, A. Brice, J. Feng (2011). (16) Y. Ren, H. Jiang, D. Ma, K. Nakaso, J. Feng (2011). Parkin Degrades Estrogen Related Receptors to Limit the Expression of Monoamine Oxidases. (15) H. Jiang, D. Cheng, W. Liu, J. Peng, J. Feng (2010). Protein Kinase C Inhibits Autophagy and Phosphorylates LC3. (14) Y. Ren, H. Jiang, F. Yang, K. Nakaso, and J. Feng (2009). Parkin protects dopaminergic neurons against microtubule-depolymerizing toxins by attenuating MAP kinase activation. (13) Q. Jiang, Y. Ren, and J. Feng (2008). Direct Binding with Histone Deacetylase 6 Mediates the Reversible Recruitment of Parkin to the Centrosome. (12) Y. Ren and J. Feng (2007). Rotenone Selectively Kills Serotonergic Neurons through a Microtubule-dependent Mechanism. Microtubule: a Common Target for Parkin and Parkinson's Disease Toxins. (10) Q. Jiang, Z. Yan, and J. Feng (2006). Neurotrophic factors stabilize microtubules and protect against rotenone toxicity on dopaminergic neurons. 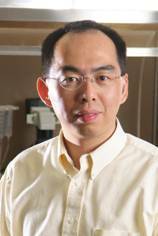 (9) H. Jiang, Q. Jiang, W. Liu and J. Feng (2006). Parkin Suppresses the Expression of Monoamine Oxidases. (8) Q. Jiang, Z. Yan, and J. Feng (2006). Activation of Group III Metabotropic Glutamate Receptors Attenuates Rotenone Toxicity on Dopaminergic Neurons through a Microtubule-dependent Mechanism. (7) Y. Ren, W. Liu, H. Jiang, Q. Jiang, and J. Feng (2005). Selective Vulnerability of Dopaminergic Neurons to Microtubule Depolymerization. (6) F. Yang, Q. Jiang, J. Zhao, Y. Ren, M.D. Sutton and J. Feng (2005). Parkin Stabilizes Microtubules through Strong Binding Mediated by Three Independent Domains. (5) H. Jiang, Q. Jiang and J. Feng (2004). Parkin Increases Dopamine Uptake by Enhancing the Cell Surface Expression of Dopamine Transporter. (4) H. Jiang, Y. Ren, J. Zhao and J. Feng (2004). Parkin protects human dopaminergic neuroblastoma cells against dopamine-induced apoptosis. Genetic factors in Parkinson's disease and potential therapeutic targets. (2) J. Zhao, Y. Ren, Q. Jiang and J. Feng (2003). Parkin is recruited to the centrosome in response to inhibition of proteasomes. (1) Y. Ren, J. Zhao and J. Feng (2003). Parkin binds to a/β tubulin and increases their ubiquitination and degradation. 1993-1997: University of Tennessee, Memphis, TN. Ph.D. Biochemistry (1997), research advisor: James N. Ihle, Ph.D.
1986-1990: Nanjing University, Nanjing, China. State University of New York at Buffalo, Buffalo, NY. Research advisor: Paul Greengard, Ph.D.
Top 100 Principle Investigators, State University of New York at Buffalo (10/05). Visionary Inventor Award, State University of New York at Buffalo (5/05). Promising Inventor Award, State University of New York (11/04). Young Investigator Achievement Award, SUNY-Buffalo (5/02). Theodore and Vada Stanley Foundation Research Award (8/98-7/00). Ralph R. Braund Young Investigator Award in Cancer Research, Univ. of Tennessee and Memphis Cancer Society (4/97). Alma and Hal Reagan Fellowship in Cancer Research, Univ. of Tennessee (7/95 - 6/97). This is the prelecture talk before the Michael J. Fox's Distinguished Speaker Lecture at UB. Parkinson's Disease Research at UB, introduction to Michael J. Fox's speech at UB.